"Of all the paths you take in life, make sure a few of them are dirt." 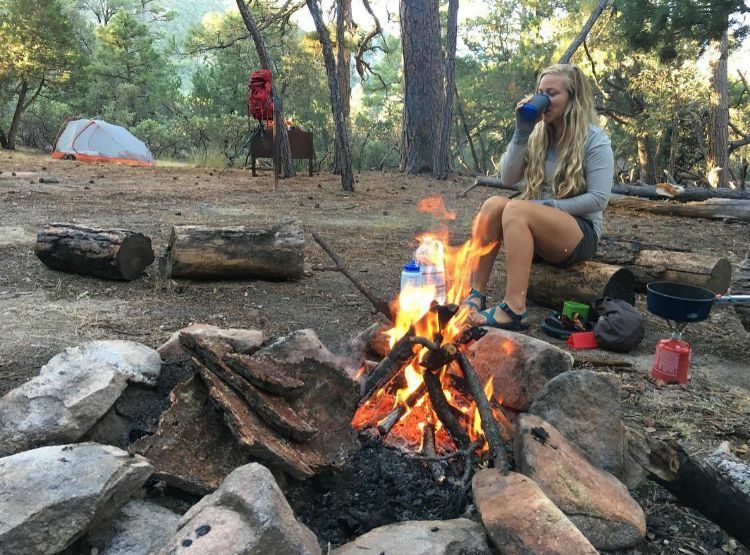 This advice comes from famed naturalist John Muir, and Ben and Mande have taken his words to heart. Both of them love the outdoors and have a great sense of adventure. 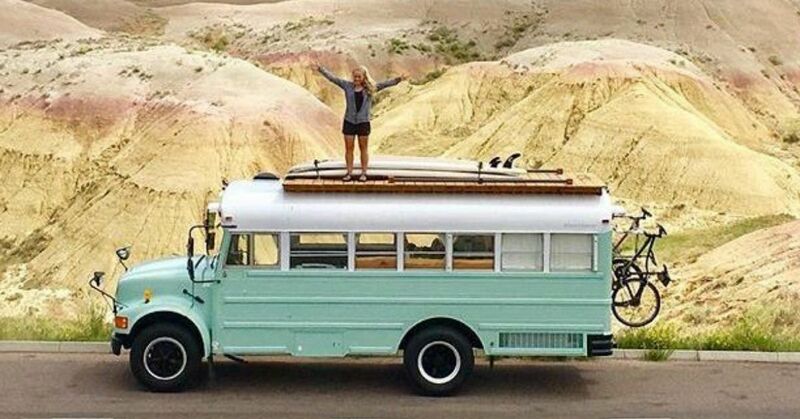 Two years ago, they converted this former school bus into their new traveling home. They named her Fern and painted her the color of the lakes in Banff National Park in Alberta, Canada. Then they set out to explore the outdoors and follow a few dirt paths of their own. 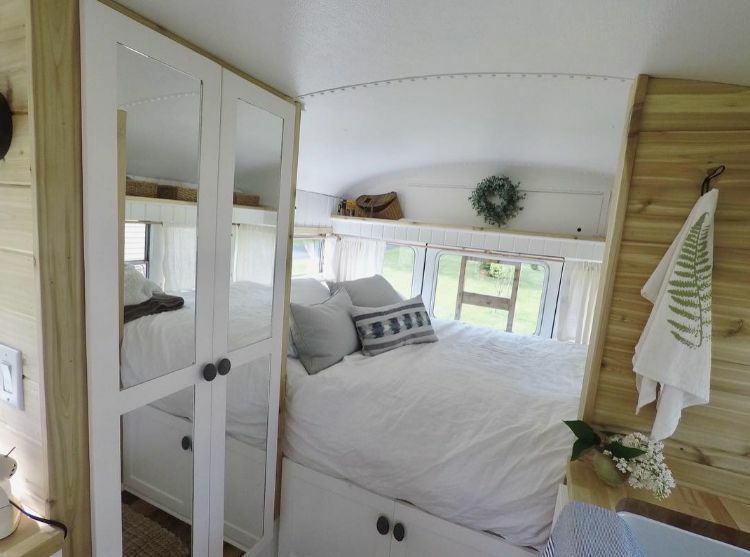 Fern is 24 feet long, and she has a diesel engine and a manual transmission. 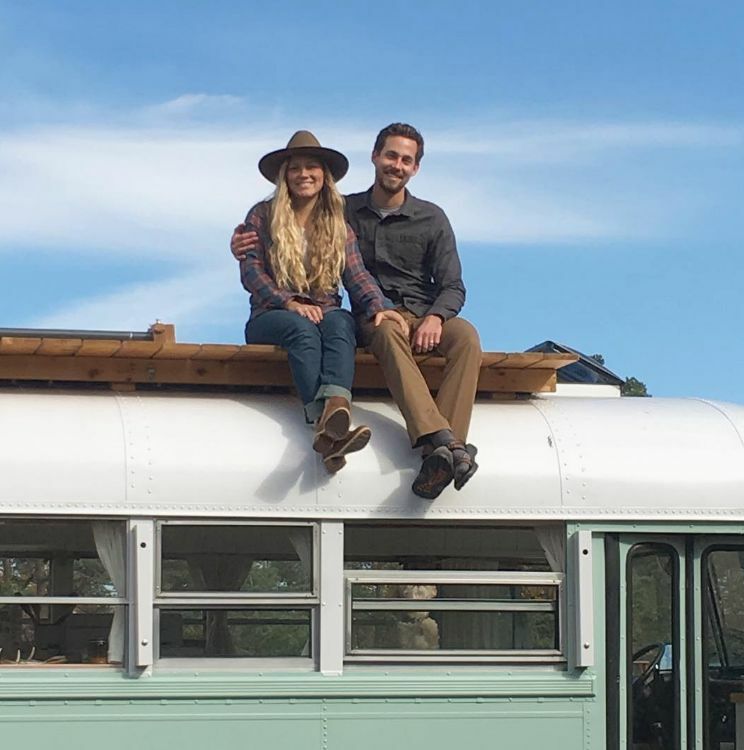 Ben and Mande say this feature helps the bus climb and descend mountain roads easily without relying too much on the brakes. They added a cedar rooftop deck so there's room to store their paddleboards and stargaze at night. Ben and Mande met through friends who knew how much they both loved to travel. Their journey together began in Michigan, and from there they have explored Utah, Wyoming, Idaho and Montana, as well as Canada. 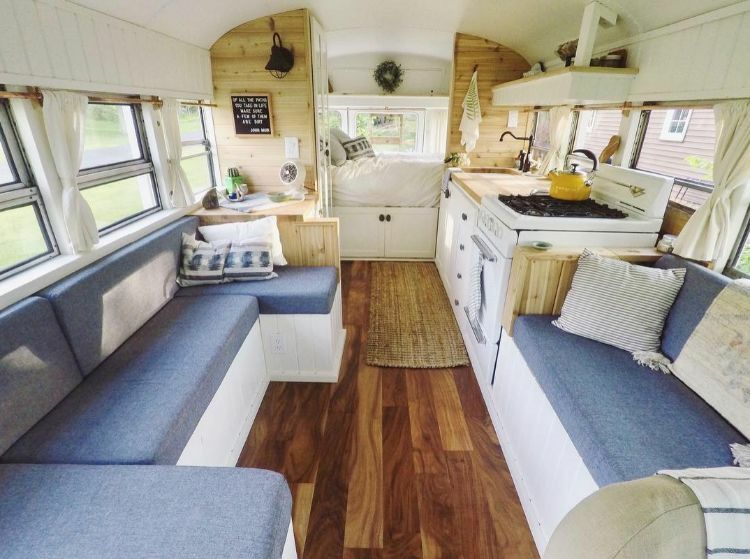 Every inch of the bus interior was renovated and transformed into this roomy and comfortable home. Everywhere you look you'll find the textures and colors of the outdoors. The wood floors are acacia, and the walls are a mixture of natural cedar and white painted pine. The blue tones of the cushions and pillows reflect the color of the sky that fills the window as the best kind of living artwork. The counters are made of butcher block, which provides a solid surface for hot tea while relaxing with a book. There's also plenty of space to display treasures from past adventures. 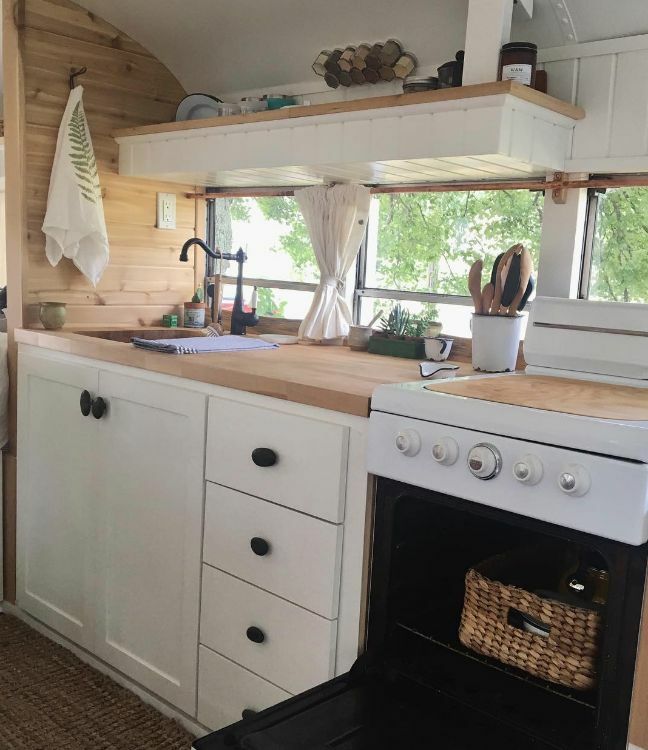 In a small space, every inch must be put to use, and even the oven doubles as storage when it's not in use. It was salvaged from a 1950s RV and works beautifully. Ben built the custom wooden cutting board to cover the stove during travel to eliminate any rattling noise. The kitchen counter doubles as a prep surface as well as a dining table. 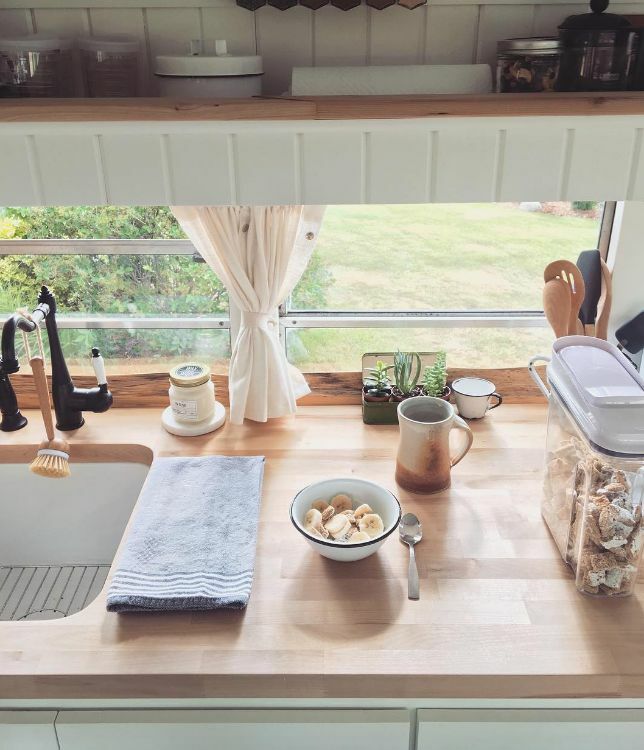 Ben and Mande point out, "When your whole kitchen is a breakfast nook, you eat at the counter and enjoy the view!" They will both admit that their favorite place to eat is outdoors. It's where food always tastes the best. 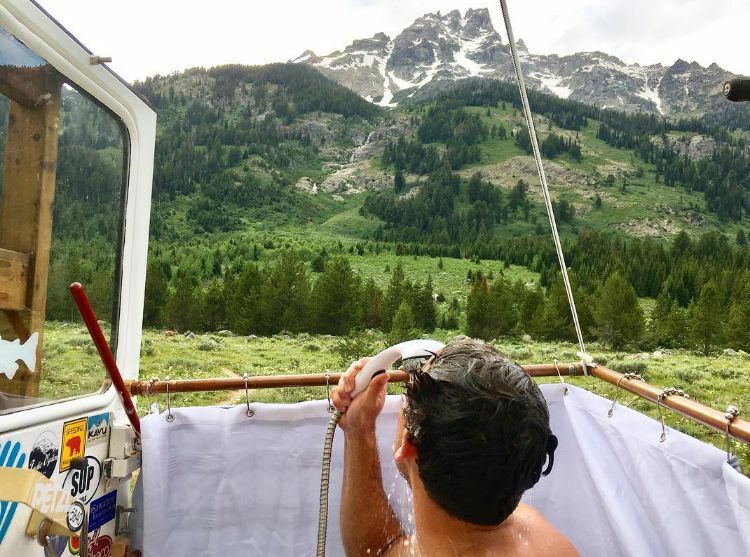 After a long hike in Grand Teton National park, there's nothing like an outdoor shower, made possible by a tankless hot water heater. 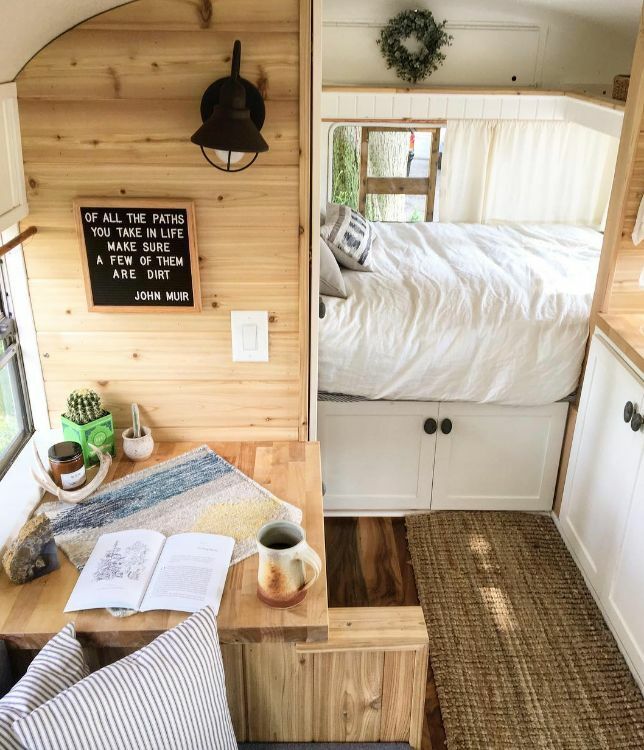 This outdoor design maximizes the interior space, and it ensures that the bus is compact enough to manage city streets as well as climb mountain roads. "Once in a while we get to watch elk graze while we shower in the shadow of the Grand Teton!" These mirrored double doors serve several purposes. 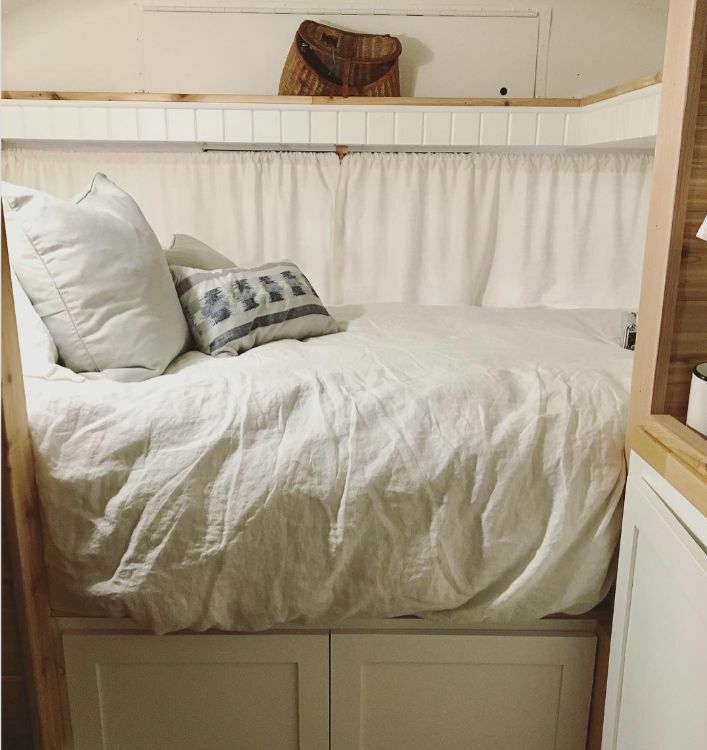 They hide a perfectly sized closet that's combined with a composting toilet. The mirrors are also a way to reflect the view from the outside and expand the feeling of space in their home. After a full day in the great outdoors, the bedroom is a perfect place to get a full night's sleep. The bed is an extra-large full, which is the width of a full but the length of a queen. The curtains can be drawn for privacy or opened to enjoy the view. 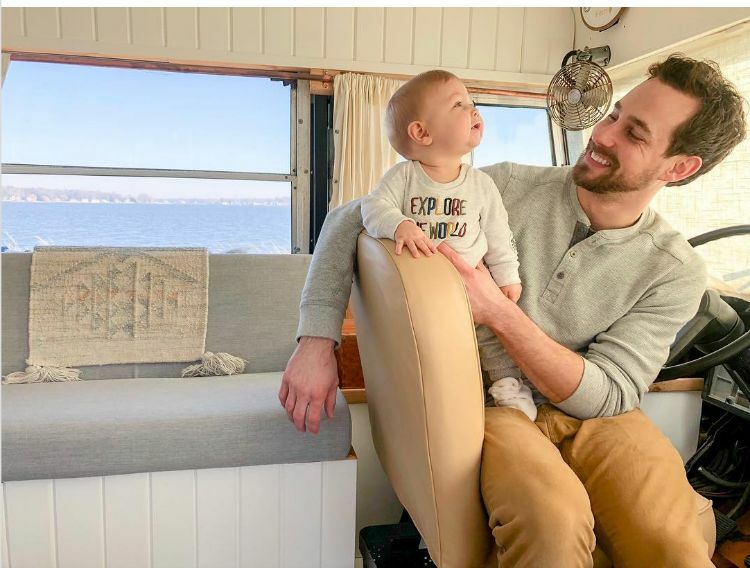 Ben and Mande's young son Sawyer has definitely inherited his parents' love of travel. As Sawyer continues to explore the world on Fern the Bus, his parents are happy to know that nature is his first classroom.